Dr.Amitha Indersen did her M.D. in Obstetrics and Gynaecology from the prestigious Madras Medical College during which she received the best research paper for the year award from the OGSSI , for her thesis. She did her Fellowship in Advanced Obstetric and Gynaecological ultrasound from Mediscan, Chennai. It was then that she found her calling in Fetal medicine. She went on to do a 2 years Postdoctoral Fellowship in Fetal Medicine in Mediscan under the mentorship of Dr.Suresh Seshadri and Dr.Indrani Suresh.She also holds a Tamil Nadu M.G.R. medical university Fellowship in Fetal Medicine. She is Fetal Medicine Foundation, UK accredited for fetal screening protocols. 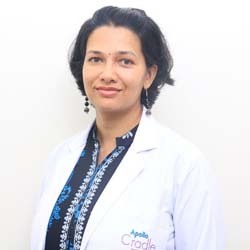 Dr.Amitha is trained in the detection and management of fetal anomalies, Fetal therapy, fetal Echocardiography, Fetal Doppler assessments, 3D&4D imaging, invasive procedures ( like Amniocentesis, chorionic villus sampling, cordocentesis, intrauterine transfusions, fetal reduction, etc) and counselling. Fetal Medicine is a passion for her. The aim is to provide the best in terms of expertise and technology for the unborn fetus.Providing answers and guidance for those little ones and families who have any problems and to help them have the best possible outcome is the ultimate aim.